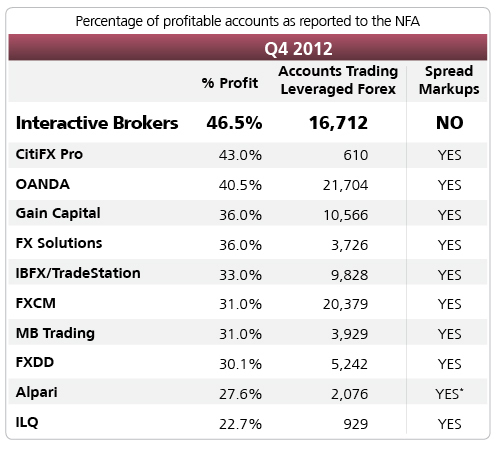 Interactive Brokers Group, Inc. (NASDAQ GS: IBKR) was recently ranked as the leading forex broker by percentage of profitable customer forex accounts according to a composite Forex Broker Comparison produced by the website Forex Magnates. The comparison was comprised of data from 11 of the largest forex broker performance reports as submitted individually to the regulator, the National Futures Association (NFA), for the fourth quarter of 2012. The comparison is as follows and can also be found at http://forexmagnates.com/q4-2012-forex-traders-profitability-report-us-forex-market-keeps-losing-brokers-and-accounts/. Interactive Brokers (IB) offers FX traders direct access to interbank forex quotes on 19 different trading currencies, never engaging in hidden price spreading, markups or kickbacks. IB combines real time prices from 13 of the world’s largest FX dealing banks plus a transparent, low commission that avoids the conflict of interest of FX platforms that deal for their own account. IB’s FX routing provides best-execution functionality and a transparent pricing structure, with displayed spreads as small as ½ PIP and actual spreads even lower. The same philosophy and technology that enables IB’s clients to achieve superior forex trading results also drives our clients’ trading and investing of stocks, options, futures, and bonds worldwide on over 100 markets. Annalisa Sarasini joins smartTrade Technologies as Global Head of Sales.